It’s a very exciting time for basketball players in the North East who are currently preparing to travel to Hungary to represent their region at an international basketball tournament there, as part of the North East Basketball Board’s (NEBB)’s development programme. 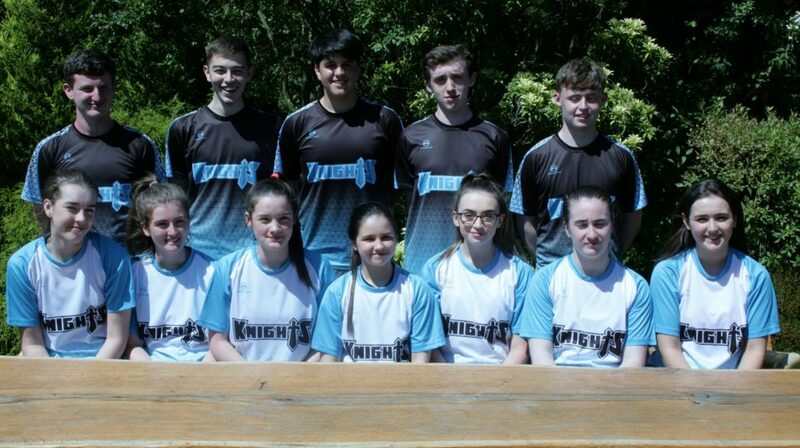 The U16 and U18 Girls and Boys North East Knights squads will travel to Hungary next week to participate in the INTERSPORT YOUTH BASKETBALL FESTIVAL 2017 along with teams from across Europe. A total of 50 players from clubs in Meath, Cavan, Louth, Monaghan and Westmeath are involved in the squads with 15 of those from Dunshaughlin Rockets Basketball Club. From our U18 Boys Lorcan Carroll, From our U18 Girls Niamh Curtin and Eimear Traynor, From our U16 Boys Kyle Roche, Evin Walshe, Ethan Mahase, Henry Benson, Jack Dardis, Cormac Curtin and From U16 Girls Sorcha Malone, Fiona Cahalin, Jane Larkin, Saoirse Walshe, Shauna Somerville and Hannah Dardis will travel to the town of Kaposvar with their team mates to take part in a 5 day festival of basketball, as well as have the opportunity to experience the culture and scenery of the area. The teams will play over the course of 5 days from 3rd to 7th July, facing opposition from Hungary, Estonia, Poland, Germany, Turkey and Egypt, to name but a few. While in Kaposvar the teams will be accommodated in the University campus and in their limited free time will have the opportunity to enjoy the specially organised range of social activities in the festival village as well as visit the water park at nearby Lake Balaton. A 12 person strong team of coaches, managers and other personnel will be supporting the players including. The team managers and coaches are looking forward to the players and themselves experiencing basketball at European level and having the opportunity to play and watch teams from some of the strongest basketball nations in the world. The whole experience should be a significant building block for the development of basketball in the North East. Trials for the four teams began in January with team selections taking place in February. Since then the players, along with their coaching and management teams having been meeting up for regular training sessions and challenge games. This in itself has seen the squads travel to Ballyshannon, Lucan and Dublin for a number of very enjoyable one day tournaments as part of the team building process. There are of course many expenses connected with a trip of this nature including team kits, kit bags, ‘walk out gear’, medical kits etc. Whilst a lot of fundraising has been undertaken by the players and their clubs the trip would not be possible without the financial support of a number of sponsors for which the NEBB is very grateful – last weekend players enjoyed a team building weekend in the Carrickdale Hotel outside Dundalk where they were presented with their team gear and kit bags. The occasion was also an opportunity to acknowledge some of the sponsors including Roma, Cavan Town, and O’Reilly Hoofcare, Virginia, and all those who have contributed financially to the venture are greatly appreciated, including those who don’t want any public recognition. The teams were delighted to be joined on the day by the President of Basketball Ireland, Theresa Walshe, who encouraged the players to do themselves proud and embrace every moment of their experience in Hungary. The North East Basketball board is the Official Area Board of the North East, as recognised by Basketball Ireland, and is responsible for the development and promotion of basketball in Cavan, Monaghan, Louth, Meath & Westmeath. The Board runs leagues for juvenile teams from U12 up to U18 as well as senior men’s and ladies leagues. U14 Boys and Girls regional teams have also represented the North East at a number of tournaments this year, and the NEBB looks forward to expanding its development programme in the future. The U16 and u18 squads have been working hard for this tournament, but no matter what the outcome on the court, this trip will be an experience of a lifetime for this enthusiastic squad of players and mentors.